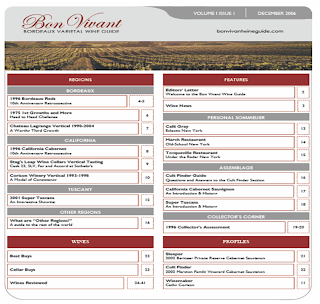 If you haven't had a chance to navigate on over to the Bon Vivant Wine Guide, now is as good a time as any! Not only have we uploaded our December launch issue -- which is chock full of good stuff, including more than 90 wine reviews -- but we just published the printable pdf edition in the "interact" section. Click here for your free 11-page sample of the print edition or subscribe now and get the entire 41-page first issue. Now you can tuck Bon Vivant under your arm on your way to the subway -- or anywhere else life takes you when you are not online. Here are some key dates in the long winegrowing history of Bourgogne, listed in chronological order. 312: Eumenes’ Discourses: oldest known documented reference. 1115: Clos de Vougeot Château built by monks from Cîteaux. August 6, 1395: Duke Philip the Bold (1342-1404) publishes ordinance governing wine quality in Bourgogne. 1416: Edict of King Charles VI setting the boundaries of Bourgogne as a wine producing area (from Sens to Mâcon). November 11, 1719: Creation of the oldest mutual assistance organisation, the "Société de Saint Vincent" in Volnay. 1720: Champy, Bourgogne's oldest merchant company was founded in Beaune and is still in business today. 1728: The first book devoted to the wines from Bourgogne, written by Father Claude Arnoux, is published in London. July 18, 1760: Prince Conti (1717-1776) acquires the "Domaine de La Romanée", which now bears his name. 1789: French Revolution. Church-owned vineyards confiscated and auctioned off as national property. October 17, 1847: King Louis-Philippe grants the village of Gevrey the right to add its name to its most famous cru – Chambertin. Other villages were quick to follow suit. 1851: First auction of wines grown on the Hospices de Beaune estate. 1861: First classification of wines (of the Côte d'Or) by Beaune's Agricultural Committee. June 15, 1875: Phylloxera first detected in Bourgogne (at Mancey, Saône-et-Loire). 1900: Creation of the Beaune Oenological Station. April 30, 1923: Founding of La Chablisienne, Bourgogne's first cooperative winery. April 29, 1930: A ruling handed down by the Dijon civil courts legally defines to the boundaries of wine-growing Bourgogne (administrative regions of Yonne, Côte-d’Or, and Saône-et-Loire, plus the Villefranche-sur-Saône area in the Rhône). December 8, 1936: Morey-Saint-Denis becomes the first AOC in Bourgogne. October 14, 1943: Creation of Premier Cru appellation category. October 17, 1975: Crémant de Bourgogne attains AOC status. Jully 17, 2006: Creation of Bourgogne's 100th appellation: “Bourgogne Tonnerre”.